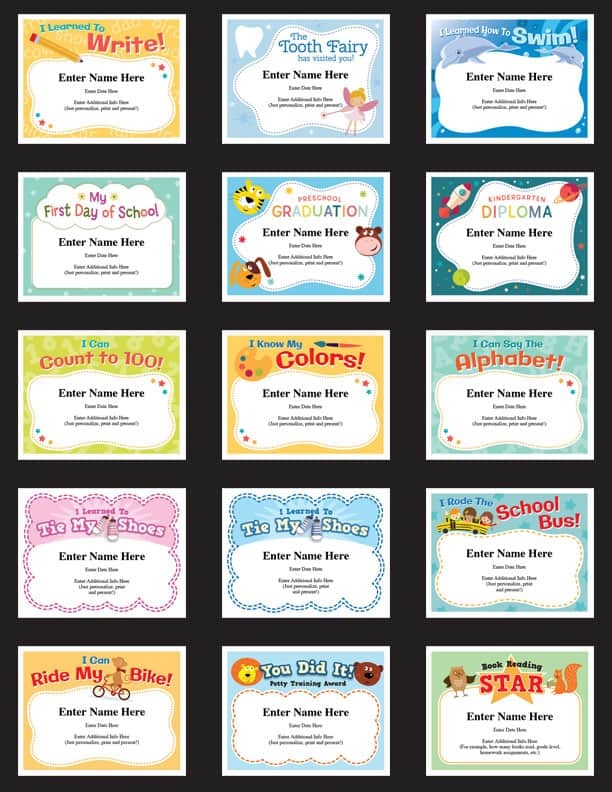 Reward kids with these fun child milestones certificate templates. When children you know reaches one of these significant milestones, recognize their achievements with these cool awards. Personalize with the child’s name, date, and words of praise. Kids can hang them on the fridge, in their room or on a bulletin board. The certificates make a great keepsake. The certificates come via a link in which you’ll download a PDF file. The PDF file works on Macs and PCs. Download the PDF to your desktop and you’re good to go. Simple to use. Great for teachers, educators and pre-school owners: If you’re working with a lot of youg kids, you’ll find plenty of uses for these templates. Parents – Sometimes you’re children need a little push and a certificate might help you potty-train your child quicker than without. Grandparents – Your grandchildren will love these! Swim teachers, art instructors and more.